Feeling quite cold today but laying down on my mum's Nightwish hoodie keeps me nice and warm. Around this time of the day my mum likes to do an hour or so of singing. Though she is busy doing other things these days, she still loves to sing. So while she's upstairs practicing I take pleasure in a nice nap before lunchtime. Take it easy everyone, and enjoy your Sunday! Your human sings? That must be nice. Mine doesn't very well! BTW, thanks so much for the Twitter RT! You are lucky to have your Mum sing to you. What sort of songs does she sing? My Mum doesn't have a good voice. Sometimes if she sings (which is not very often), my tail starts twitching. Though I try to be polite. 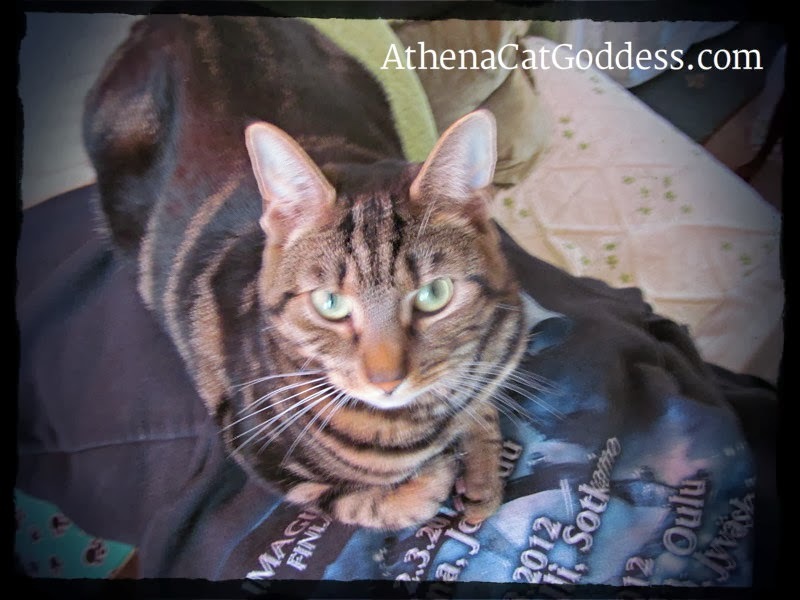 We hope you're enjoying your Sunday, Athena. Sometimes my mum sings too loud and I don't like it because I think she's angry. But I love the soft gentle side to her voice too. She sings mainly rock/pop and a bit of classical too.